Thx huskyman for your help, but unfortunately it didn't help. The track is still flashing white and this is killing me because the track is amazing and I would love to drive there without this annoying thing. 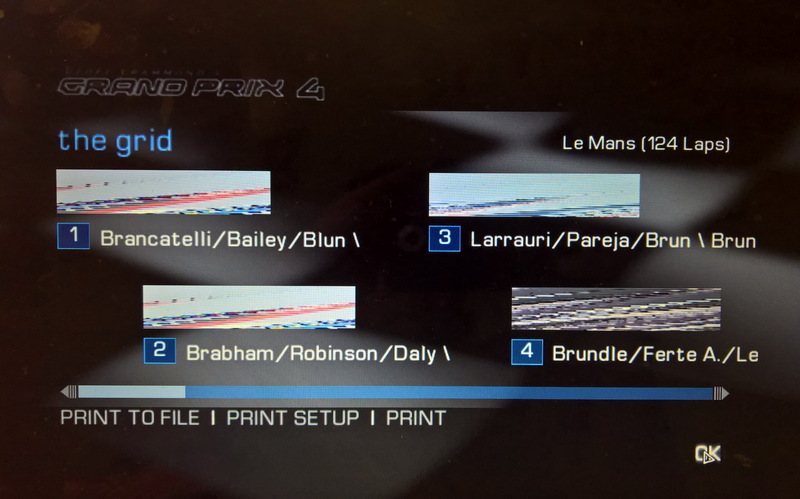 I installed the track on 2 other PC's running GP4, and the result is the same. Any other of you Guys facing the same problem? I can not imagine that I'm the only one. I uploaded a video, so you can see for your self what I mean. Also there are no cars shown on the grid page (see picture). Well, this is actually very strange! For the moment I must admit that I have no idea, what the problem is. Hopefully someone out there has one!? To identify the problem and locate the reasons I think it would be helpful to know if you have the problem also with some other tracks or only with Le Mans? Yes, the problem only appears in the Le Mans Track. I tested the track with other Mods. Still the same problem on different PC's. I tried it, but the result is still the same. Flashing like crazy. I hope drt01 can help. I did what you said, but the result is unfortunately still the same. I'm getting crazy with this issue. As I mentioned before, I tested the Track also with a lot of other Mods on 3 different PC's, and the flashing is always there. Any other help will be highly appreciated.